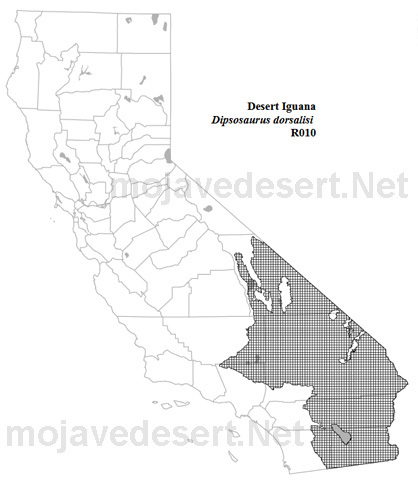 The desert iguana is widely distributed throughout the Mojave, Sonoran and Colorado deserts. Typically found below 1520 m (3300 ft) (Macey and Papenfuss 1991), its range in California broadly overlaps that of creosote scrub. Desert scrub, wash and succulent shrub habitats are used, as is alkalai scrub. It is found in greatest abundance in sandy creosote flats but can also be found in rocky or hilly areas (Norris 1953, Stebbins 1954). These lizards are primarily herbivores, eating flowers, buds, fruits and leaves of many annuals and perennials, especially creosote. Individuals have been observed to climb up to 2 m (6.6 ft) into a bush to forage. In addition to vegetation, insects, feces (mammal and lizard) and carrion have been reported in their diets (Norris 1953, Stebbins 1954). The desert iguana uses burrows extensively and also climbs into shrubs for shelter from temperature extremes, solar radiation and predators. Mammal burrows are modified or new burrows are constructed by the lizards. Burrows may consist of a shallow, short tube or a more complex arrangement with a central chamber and several exits. The central chamber may measure up to 15 cm in diameter and lie 3-5 cm deep in the soil. When the lizard is present the entrance is usually blocked by sand. This could serve to discourage predators and retard heat gain or loss. These burrows are usually constructed in the hummocks of sand that accumulate around the bases of bushes (usually creosote). Burrows may also serve as nest sites for females. The presence of sand hummocks seems to be important as a construction site for burrows (Norris 1953). Little is known about the habitat requirements for reproduction. Laboratory studies suggest that nest temperature may be a very important limiting factor at the higher elevation of this species range (Muth 1977). Permanent water is not required. Captives rarely drink. This species is herbivorous, feeding on annual and perennial plants in a variety of habitats, but seemingly reaching greatest densities in habitats that support the greatest productivity of such plant species (sandy desert flats and washes). These habitats also provide sandy, friable soil that is necessary for burrow construction. This species is more heat-tolerant than any other North American reptile. It emerges later in the year and later in the day than other lizards and remains active longer into the hottest part of the day than other lizards. In Palm Springs, it becomes active in late March to mid-April (depending upon the year), later further north (Norris 1953, Stebbins 1954, Moberly 1961, Mayhew 1971). Adults remain active until mid-summer when the young hatch. Young remain active until fall. This species emerges later in the day and remains active later than other species of lizards. Body temperatures of 45� C have been recorded, well above lethal levels for most other species (Norris 1953). Activity consists largely of foraging, moving from one food plant to the next and eating. Most of the time on the surface is spent basking in the sun on hummocks near burrows or in bushes. One study reports male home ranges of .15 ha (.36 ac) and female ranges of .16 ha (.38 ac) (Krekorian 1976). Evidence suggests that this species is territorial during the mating season. During the remainder of the active season, home ranges overlap extensively, and there is little aggressive behavior (Norris 1953, Krekorian 1976). Courtship and copulation occur shortly after emergence in the spring (Norris 1953, Moberly 1961, Mayhew 1971). Egg-laying usually takes place in late May and the young appear in late July to late August. There is considerable variation in these events from year to year and north to south in the range. There is strong evidence that only one clutch of eggs is laid each year (Norris 1953, Mayhew 1971, Grestle and Callard 1972) ranging from 3-8 eggs. Adults reduce surface activity after the appearance of the young; this may reduce competition for scarce food resources. During the period of courtship pairs of lizards (presumably male and female) have been reported foraging together (Norris 1953). This suggests the presence of pair-bonds. Few reports of predation on this species are available, but it must certainly be preyed upon by coachwhip and sidewinders (both lizard-eating snakes), probably by loggerhead shrikes and other avian predators. Young are probably eaten by leopard lizards, collared lizards and mammalian predators (coyote, kit fox, badger, etc.). This is one of the most common lizards, and also one of the biggest. Their preferred habitat is creosote bush scrubland, where they feed on the green plants of the area. They can withstand high temperatures, and are out and about after other lizards have retreated into their burrows. They are very quick critters. You will often see one run across the road, just ahead of your oncoming car. Watch it run. At high speeds they run on their powerful back legs, folding the front legs into their body. 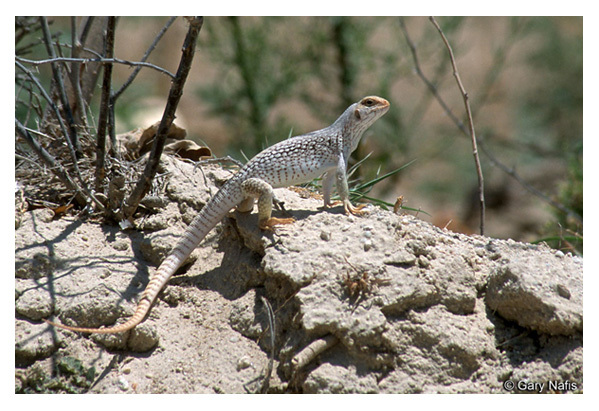 The Desert Iguana is a medium-sized (10-16 inches), light colored lizard with a long tail. Its snout-vent length can measure almost six inches, and its tail nearly 1 1/2 times longer. It has a small, rounded head with large ear openings, and sturdy legs. Broad dorsal bands span its light cream colored body, and eventually become rings around its tail. Narrow, longitudinal stripes overlay the dark bands, especially in the central and posterior dorsal areas. The bands and stripes occur in various shades of brown and gray. The dorsal scales are keeled, and become slightly larger down the center of the back. This forms a well-defined crest that extends along the back and diminishes down the length of the tail. Both sexes have a pinkish hue on their sides during breeding season. These lizards are the fastest of the desert lizards curling their tail over their backs while running. Being the most heat-tolerant lizard it seems odd that the desert iguana will close up the entrance to its burrow once inside; until it is considered, that if a predator does not know there is a burrow there, they will likely pass by unaware there is prey within inches. The Desert Iguana seems to be particularly attracted to yellow wildflowers, and seems to prefer the yellow blossoms of the creosote bush often climbing the branches to reach the little flowers.